If you are unable to find the answer to your questions about teak here, simply contact us utilizing our online contact form or call 734.418.0150 for additional assistance. Our friendly staff is available to answer your questions and assist you. Why Teak: What makes this wood so special? Care of Teak: What do I do? First, be sure you are purchasing 100% solid Grade A teak and not furniture made from Shorea wood or a combination of teak veneer and lesser quality woods that do not have the same longevity and reliability of high quality solid teak. Second, prior to construction, teak wood must be kiln dried (not air or sun dried) precisely to an optimal moisture content of 8 to 10% to ensure against later warping and splitting. Third, we recommend purchasing your teak from companies who utilize only 100% genuine plantation grown teak wood (which is reforested). Our teak comes from a long line of high quality teak plantations in Java, Indonesia, known for being of the highest quality in the world. Fourth, the presence of white (“young”) teak or knots, often masked by dark staining or heavy teak oil application, are hallmarks of inferior teak wood choice and not indicative of Grade A quality teak. Younger, lower quality wood, and knots significantly affect the stability and longevity of teak furniture and are never utilized in Colton Teak furniture or accessories. Fifth, the materials are only as good as the construction methods used to manufacture your furniture. At Colton Teak, we utilize the mortise & tenon joinery method buttressed by wood dowels & solid brass or stainless steel fittings, ensuring the strongest possible construction. 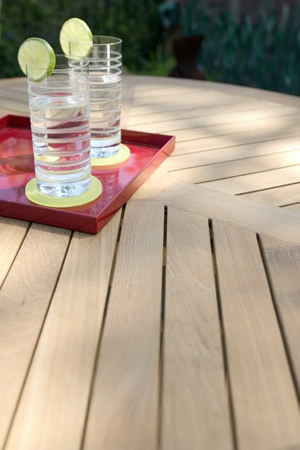 Our teak is heavy-weight, with extra thick construction. Some companies offer “lighter” construction for less, but we do not recommend this for the longevity and enjoyment of your furniture and hence do not carry such a line. Finally, are you buying furniture designed with comfort and functionality in mind? Wide, ergonomic back and seat slats for chairs, benches & loungers make all the difference in the world. Tables that feature built-in umbrella holding bases will save you money and hassle, and expansion tables that feature a two leaf system, allowing the umbrella to stay in place at all times, enable the true flexibility for which expansion tables were meant. Why is teakwood always the first choice for outdoor use? This immensely stable timber has a high oil and rubber content, a natural water repellent, which makes it virtually immune to rotting and a favorite for use in constructing sailboats and other ocean sailing vessels. Colton Teak 's outdoor teak line of furniture weathers beautifully, season after season, and can be left untreated outside without the risk of rotting. We set the highest standards in our industry and enjoy a reputation for the manufacture of high quality, low maintenance, teak garden furniture. Only the finest quality genuine plantation teak (Tectona Grandis) is selected for use in our products and then combined with top grade rattan, bamboo and solid brass castings for durable, attractive garden furniture. Left alone to age, the natural color of teak furnishings will patina to a soft, silver-grey. Imperfections, which are inherent properties of the wood, will show over time, enhancing the beauty of the furniture. In humid or wet climates, or after rains, the wood may naturally expand and contract, causing the grain to rise. This is to be expected with exposure to the elements and will stabilize after the initial weathering occurs. To maintain wood furnishings, use a soft bristled utility brush and stroke lightly in the direction of the grain to remove surface dust. For more stubborn dirt, the wood may be washed periodically with a mild solution of soapy water, then rinsed thoroughly and allowed to dry completely. Commercial hardwood oils and bleaching agents may be used to maintain or restore the natural color and luster of teak wood. Depending on climate exposure, furnishings may need to be treated one or more times per year as desired. Some wood furnishings have exposed hardware, which may require tightening from time to time. Care should be taken not to under- or over-tighten hardware. All our teak is sourced from Java exclusively from the highly reputable Perum Perhutani plantations managed by the Indonesian government. The plantations date back 150 years to when Java was a Dutch colony and settlers planted the very first teak saplings. Since that time, a great number of other plantations have grown and flourished on the island of Java. High priority is given to continuous replanting of Indonesian timber resources. Colton Teak 's outdoor teak line may be enjoyed in the knowledge that the estimated 4,000 species of tree, 500 species of mammal and 1,500 species of bird that flourish in the unique forests of Indonesia are safe and secure in their natural habitat. Forests Forever is a voluntary funded body formed to represent the interest of all timber and wood using industries on environmental issues. Its mission is to safeguard the forests of the world, future timber supplies and to promote wood as an environmentally friendly material. Please join us in supporting this noble organization.